Two cardinals facing allegations linked to sexual abuse have been removed from Pope Francis's inner circle, the Vatican said. Australia's George Pell and Chile's Francisco Javier Errazuriz will no longer sit on the Council of Cardinals, set up by the pope as an international advice body. The pair were absent from the last meeting of the group in September. 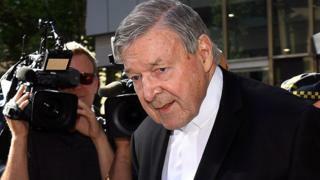 Cardinal Pell, who remains the Vatican treasurer, faces trial on sexual abuse charges in Australia - accusations the cardinal strenuously denies. His Chilean colleague, Francisco Javier Errazuriz, faces accusations that he covered up alleged child abuse while serving as Archbishop of Santiago, claims he also denies. Cardinal Laurent Monsengwo Pasinya has also left the group, spokesman Greg Burke said. The 79-year-old recently retired from his role as archbishop of Kinshasa, and has not been implicated in any scandals. The group, known as C9, has no plan to immediately fill its three empty seats, Mr Burke reportedly said.